Scroll, click, play, pause playlist, repeat ad-nauseam while Insta-Tweeting a ‘filter/no filter’ image of a meal your plug-in paranoia probably prevents you from finishing. We all dine at the bloated buffet of Spotify, the Jimmy Chung’s of the audio world. No sooner is one morsel digested than you’re gorging on another to erase its memory. Tonic, a tonic is needed, the palate must be cleansed. Methodically consuming music as we do deprives us of any sense of development. It’s for these purely self-serving reasons that a band like We Cut Corners should be cherished. Since their 2013 debut ‘Today I Realised I Could Go Home Backwards’ they have continually stretched themselves, cutting their teeth with punchy, melodically sweet songs drenched in delicately poised prose that seldom passed the three minute mark. 2016’s ‘The Cadences of Others’ saw them expand, stretching their tight tunes to maximum tautness. The songs had doubled in length but a drill sergeant could still bounce a coin on every single one. Due for release in early October, the band’s fourth offering,’ Imposters’, is a complete departure. Having honed their peddled wares of perfectly constructed, infectiously catchy, immediately engaging songs they’ve abandoned their building blocks. Dissolving their surface, yet still managing to erect a beautiful record upon a free-flowing foundation. Rather ironically, for one of the most original bands around three of the tracks on ‘Imposters’ are titled Imposters. Only an additional ‘I’ differentiates each – it’s a meandering opus spread over three tracks, acting as the record’s spine. That’s where the repetition ends. From start to finish ‘Imposters’ is a surging, exploratory triumph. There’s an old Hollywood story about the Coen brothers. When they felt they’d written themselves into a corner but wanted to avoid repeating themselves, they’d drive around in the sweltering L.A heat with the windows rolled up, no air-con, until they’d come up with something they hadn’t written before. ‘Imposters’ reeks of the same essence. From the ghostly, idyllic opener Imposter gently coaxing us into Rainy Night In Slomo’s rhythmically hypnotic, pulsating drive that teeters on the brink of explosion without ever detonating, this record leads you down alleyway after alleyway before escaping over the looming walls of predictability. Blowing the doors off would be the obvious thing to do. The dichotomy of We Cut Corners is perfectly showcased on Original Sin, a song that wrestles with anxiety and self-loathing, but is delivered with the venom and conviction to overcome it all. The Specialist is perhaps the only song on the record that could have fit on previous offerings, a perfect slice of sharp, jagged pop. Four songs in, it’s a sorbet for those expecting bite-size canapés. Stranded is a ballad from whoever was on the receiving end of the pirate from A Pirate’s Life attentions on ‘Today I Realised I Could Go Home Backwards’. Eke is another curveball, based on a muscle-bound 60’s r’n’b garage riff the band may have avoided on previous records. Embracing the brawn, they’ve produced a Twist and Shout for the twisted shouters of the nihilistic, droop chin variety. Laughing Manically embodies the band’s sense of urgency while displaying the unique, entwining relationship between Conall’s vocal and John’s guitar. Lyrically, ‘Imposters’ may be their best work to date. Evocative, self-deprecating, emotive, acerbically witty and at times viciously cutting, they have encapsulated the anxiousness of the modern world and the brazenness to stick two fingers up at it at the same time. 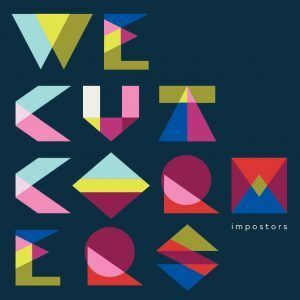 ‘Imposters’ is undoubtedly a departure from the lineage of previous records, sonically and structurally. However, it is ultimately a continuation of the characteristics that the band have from their first recorded note.